I have arrived back in Brisbane to cool wet weather….no problem, it is nice to be home. One of the things I love most about Italy is the delicious food. I will miss my cappuccino and apple sfoglia every morning, just a short walk across the bridge at Il Monaco, saltimbocca at Del Sonno and everything at Paris Boheme in Lucca. However, one of the first things I love to do when I get home is head off to the markets at James Street and buy great things to cook. 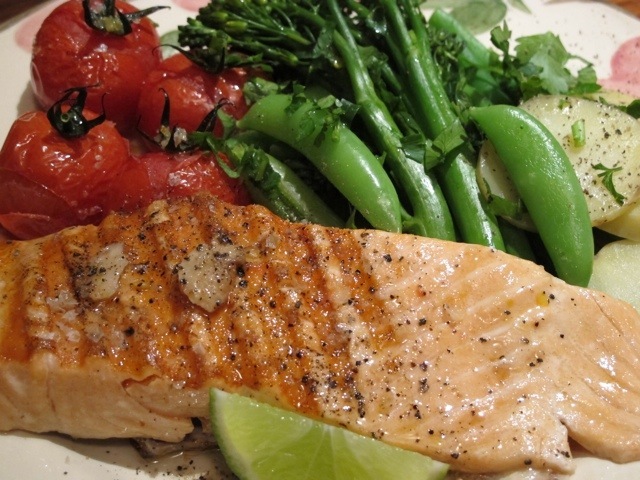 My first meal at home is always grilled Tasmanian ocean trout with roasted tomatoes and steamed vegetables. I have lots of photos collected in my 5 months in Europe. Over the next few weeks I will sort them and share all the lovely places we visited on this trip. There will be more on Bagni di Lucca, Sardinia, Lucca, Florence, Amsterdam and some new things from Brisbane. I want that meal NOW!! It is lunchtime here, my stomach is growling and that photo is doing me in!!! James Street is a great place to shop, the food always looks so good. Glad you had a safe trip home … enjoy! I will only be home for a couple of months so I will be making the most of my time here. We miss you here, but very hot. Wendy and I are keeping busy! I am already missing Bagni di Lucca….but not the heat, give me this lovely cool weather any day. Wow, judging by the looks of THAT meal you could hang out your own ‘shingle’. Trattoria Debbio, Osteria Australiano, Ristorante Ricco di Debra or simply ‘Qui si Mangia Bene’!! What a rich and full life you have. You make every minute count; a nice affirmation for the rest of us. A gift that you just keep on giving. Thanks! Perhaps I could turn Casa Debbio into a trattoria, that sounds like fun. Hmmm, that’s sounds great. Splendour in the hills! And food too?? Wow, you go girl, nothing seems to stop you….well, except the rigmarole, Italian style. Trusting there’d be lots of hoops to jump through; but the thought and fantasy, the smells and the tastes…..hmmmm we just keep on dreaming!! Hi Deb. My husband (Steve) and I love to travel. We have visited Italy a couple of times and really love it – especially the food!! It has been my dream to stay there for an extended period, even undertaking Italian at night for a couple of years before relocating to coastal South Australia. I initially googled properties for sale / renovation about 12 months ago, as an option to fund our extended stay and keep us occupied whilst there (as Steve is a stonemason, plastere, tiler etc etc) but really had no idea as to where. So tonight I was looking at extended renting instead, and a property came up in Bagni di Lucca, which resulted in me googling the town and finding your blog site. The town looks like somewhere I could live and be very happy. it is good to see there are plenty of Aussies following their dream to Italy. I will be very interested in keeping abreast of your blog and hopefully may be able to get there in 2013/14. Love your photos and they only pique my interest more. Will be in Brisbane (Bribie) for a couple of weeks next month. Hopefully the rain will have abated by then! Cheers, Claire. Let me know when you are in Brisbane and perhaps we can meet and it can tell you all about Bagni di Lucca. It would be great if we could catch up and get the gen on Bagni di Lucca and living in Italy in general. We fly to Brisbane / Bribie on 18 July staying in a private house, address unknown. However, we will be staying overnight in an airport hotel Sat 4 Aug as we have an early flight home on the 5th. If we could arrange a meet that would be fantastic. My email address is debrakolkka@gmail.com Let me know where and when you would like to meet. Thanks. I will email when further details are known to see what can be organised. Hope to catch up then. Glad you made it home safely, and looking forward to reading more. Hope to see you next season in Lucca. Are you there in November? I haven’t booked yet, but I am planning to go back in September to keep on with the house. Will you be there in early November? We go for Thanksgiving holiday each year, so typically in Florence for that, then to Lucca either before or after. What about you? Great to hear that you arrived safely. The trip home was long but uneventful….which is all we ask of long distance travel. Glad you are home sweet home and being a trout lover, your meal looks scrumptious! I look forward to following your Springtravel photos, Debra. I have enough to last at least until I go back. This looks so good, nothing beats the tomatoes in Italy-they are just simply the best! You are right, nothing beats Italian tomatoes, but these are Australian and pretty good too. I’m sorry, I totally misread that and thought they were from Italy! However, still looks delish! Welcome home. Your food looks fabulous. Now I’m hungry! Any left-overs? I ate the left over tomatoes for breakfast. Your meal looks delicious – and now I am feeling hungry! Welcome home. Thank you, it is good to be home for a while. We really are following you everywhere Glad your trip was “uneventful.” That’s all we ask! No place like home, at least until it’s time to leave again! That meal looks delicous. Enjoy your time at home and especially the cool weather. The sun was out today for a perfect Brisbane winter day. It is great to do all the things you miss when you get home. 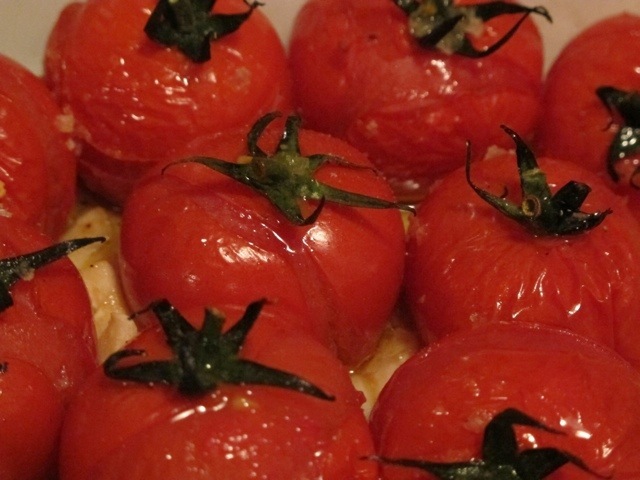 I love oven roasted tomatoes! Now that sounds good! I must admit I’ve never done it before! DO you just put olive oil on them and bake on high heat? Now is Minnesota tomato season and I’ve been buying them at the farm stands daily and loving them! Mmmm….. I used the tiny vine ripened tomatoes, the size of cherry tomatoes. Just put a little bit of olive oil, salt, pepper and some garlic over the tomatoes and bake them in the oven, not too hot until they collapse a bit. Debra, my first meal back in australia is usually a prawn dumpling noodle soup at Chinatown just behind Adelaide Central Market. It always hits the spot. Your trout looks wonderful though. Welcome home! Thank you for the welcome home. Let me know when you are travelling to Italy again. Great to hear you are happy to be home, I will be home late in the year and cannot wait for some Aussie fresh summer food!! As much as I love Italian food, I love to come home to the different varieties of food we get here. I thought it was a fitting thing to eat on my last day in Italy. Bentornata Debra!! I wish I shared your enthusiasm I really do!!! I just got in myself a few hours ago…. Home is Brisbane……for now. I love the weather here in winter, you’ll get no sympathy from me on that score.